It’s our right to be safe at any age. How can we make it easier for older victims to get help? In many ways, the impact of living with domestic abuse is the same for all victims – regardless of age. Everyone worries about not being believed, or having to live with the stigma of abuse. They worry about what will happen to them financially, if the abuse will get worse or what might happen to the perpetrator if they do speak out. Older victims might not recognise what’s happening as abuse. It goes without saying that there is no ‘typical’ victim of abuse. But it’s normally younger women or families who are portrayed in leaflets, posters and campaigns. This is matched by a wider lack of services and resources which take into account the unique needs of older victims. They may be reluctant to talk about it. Generational attitudes towards relationships mean some older victims might accept the abuse as “the way it’s always been”. Older women may be from a time where it was not socially acceptable to talk about problems in their relationships; where women’s roles were confined to the home and divorce or separation were taboo. They don’t know about the help that’s available. Services open and close so frequently, and the support that’s out there varies from one area to the next. If older people don’t have access to the internet or the skills to use modern technology, how will they know where to get help? Or have been let down in the past. They may have health or mobility needs. Older women are statistically more likely than younger women to have health problems, reduced mobility or other disabilities which means their situation makes them more vulnerable to harm. This could also mean a loss of ability to communicate clearly if they’ve suffered a stroke, heart attack, have hearing loss or have experienced other chronic disorders. It could also mean they’re more isolated – both physically and socially. Another common barrier among those victims with health or mobility needs is that the perpetrator of the abuse is also their carer. This can lead them to become further isolated from friends, family and support. This is especially the case for victims who have depended on the perpetrator for much of their lives. They may also make threats to put the victim into a care home if they tell anyone about the abuse. Family and friends aren’t supportive. Some adult children will be supportive of their parent and encourage them to leave or seek help. But others can create barriers by expecting women to stay, continuing to assume the carer role to an elderly father. The responsibility they place on themselves to be the carer of the abusive partner or child can also be too much. They think it’s too late. We know that older victims are much more likely to live with abuse for prolonged periods of time. The thought of having to give up the home they’ve lived in for many years, leaving behind pets and treasured possessions, can be too much. After a lifetime of contributing to the family business, homes or other assets, many fear they will be left with nothing. And, too often, life can get in the way – the death of family or friends, birth of grandchildren, retirement, moving house – and victims can feel the time isn’t right to seek help. A version of this article appeared on the SafeLives website on 22 July 2016. Monsura Mahmud is a Domestic Abuse Prevention Adviser for the Silver Project, a specialist service for women aged 55 and over affected by domestic and sexual abuse. 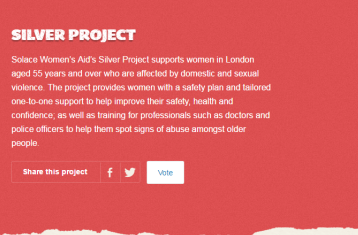 The Silver Project is run by Leading Lights-accredited Solace Women’s Aid and provides one-to-one support, as well as training professionals who come into contact with older victims. If you need help, support or want to discuss your options call – free and in confidence – 0808 2000 247. In an emergency, or if you are or feel threatened, call 999.